You will receive an email-confirmation giving details of what you have ordered. It will also give you an estimated date of despatch of your order. If it's not right – then please email [email protected] so that we can put it right for you. Please note we can only accept changes to your order up to 7 days after your have placed it. Your order will then be sent to our workshop. All garments ordered through this site are made by hand for you when you order them – they are not kept in stock – so making your order may take a little time. If you need your latex faster, please visit out sister site www.LatexEXPRESS.com, where you'll find a good selection of Libidex garments available direct from stock for immediate despatch. Or you can use our Rapid Order Service to have your made-to-order garment despatched in 10 working days. Once your order is ready, we will let you know that it is on its way to you. You can check on progress of your order by using our Order Tracking Service. We will add the cost of postage and packing to your order. Our delivery charges are based Royal Mail 1st Class signed-for Delivery in the UK, and Royal Mail International Signed delivery to the rest of the world. The price is calculated according to the size, weight, value and destination of the consignment. We can ship your order to anywhere in the world. When your order is delivered, it has to be signed for when you receive it. If the postman delivers when you are out, then your order will usually be taken to your local sorting office, and you will be left a note that it is there for you to collect. We cannot be held responsible if you don't collect your order from the post office. Arrangments for collection may vary from country to country. If you need your order delivering fast, or prefer not to trust the post, then we can arrange to send your order by courier - at extra cost. We will send your order by one of our selected couriers such as UPS or FedEx and you will receive your items in 1-2 days within Europe and 3-4 days for the rest of the world (depending on where you live). Please note that we do not arrange delivery on customers' behalf using customers' own courier accounts. If you wish to use your own courier, you must arrange collection, delivery and payment directly with them yourself. All our garments are hand-made, and production is now taking 10 to 20 days. Orders are sent out when production is complete. If you need your order urgently we offer a quick production service called 'Rapid Order' (This is a guaranteed 10 working day production and despatch service which is charged at an extra 25% of the original price of the item- not the discounted price).PLEASE SEE CHECKOUT PAGE FOR AVAILABILITY OF THIS SERVICE. Delivery time is additional to production time and depends on your location and your local postal service. Goods are always sent by tracked and signed for postage. However if you need you goods urgently and you want us to send your items by courier, please select this option at the check-out. Because our goods are customised and made to order, we are not obliged to offer refunds if we are not able to deliver by a specified date. Please refer to section 3.5 of our full Terms & Conditions. 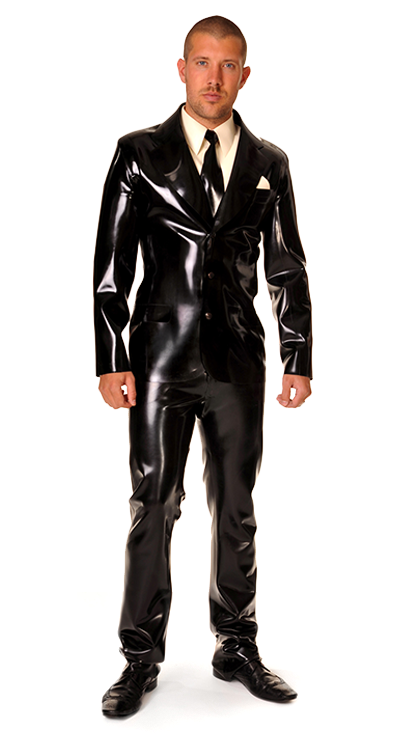 If you want your made-to-order latex garments in a hurry, we can offer you our Silver Rapid Order Service. For an extra 25% (calculated from the original NON-discounted price), we will expedite your order through our workshop, so that it will be despatched in 10 working days. "Working days" mean Mondays to Fridays only, excluding weekends and UK public holidays. The additional price for this service is calculated on the full retail price of the garment, not on any discounted or sales prices. Despatch times will be calculated from the day we receive your order, provided it is placed and paid for in full on that day by 2.00pm UK time. Please remember that while we aim to despatch your order within a given time, we cannot guarantee delivery by a specific date, since we have no control over national or international postage / courier services. We will only start work on your order once it has been paid for in full and we have fully verified your bank credit card, billing and shipping address. In some circumstances – particularly for larger orders or overseas cards - we may have to carry out additional checks. We will of course inform you if there is any delay due to these checks being made. Once all checks are complete your order will then be processed. The above services are subject to availability, and that we may occasionally have to suspend them if we have a large volume of orders to deal with. If your garment is the wrong size, we will replace it for one of the right size free of charge (apart from return postage) provided you return it within 7 days of purchase. Please note that it may take up to 20 days to replace the garment.